Ekonk Community Grange #89 in Moosup, CT, received third place recognition for its community service efforts in the 2010 National Grange Community Service Awards Program, which was presented in November during the 144 Annual Session held in Charlotte, NC. J. Allen Cameron is the Master of Ekonk Community Grange #89 and its 145 members. Fifty three participating members contributed an astounding 16,121 hours to their community service projects, along with the help of 117 community volunteers who themselves contributed over 617 hours. The Ekonk Community Grange began several new projects this year which included helping to coordinate a memorial service in honor of the victims of 9/11, purchasing a new Ekonk Grange banner, and sponsoring a pie-eating contest at Sterling Family Day. On-going projects included taking gifts to residents of convalescent homes, participating in Sterling Family Day (which included helping raise $14,000 to fund the event), “Words for Thirds” dictionary project, Relay for Life sponsorship and participation, hosting the annual Earth Day poster/essay contests in local schools, supporting FFA through various donations, maintaining the Sterling Municipal Building, adopting needy children for Christmas, and much more. The Ekonk Community Grange has a long history of charitable community service, and offers assistance to any requests for help. 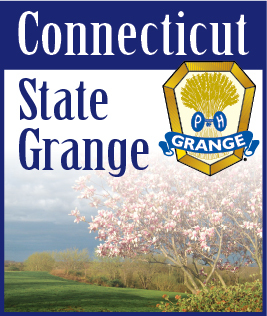 Established in 1867, the National Grange is the oldest agricultural and rural community service organization and meets annually to confer the Seventh Degree (the highest Degree of the Order), to develop its legislative policy for the coming year, and to recognize the talents of its members. There are over 200,000 members in 2,700 communities in 36 states throughout the United States.